If you're a beauty box junkie, you would know that the past month, Bag of Love has continually teased and excited their subscribers, me included :p There was so much hype about their special edition bags well as their July bag. Parallel view of the products in the courier bag. As some of the products couldn't fit into this month's bag, The Face Shop and Etude House products were thrown into the courier bag on its own, which was fine for me, considering they came in deluxe sample packs, so even though they were thrown around, they were still in good condition. 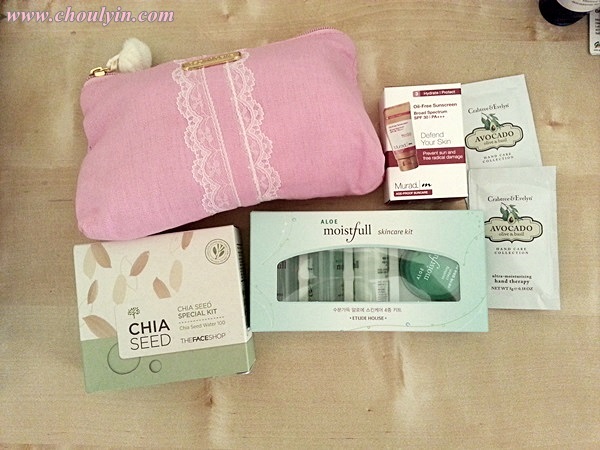 First up, THEFACESHOP Chia Seed Trial Set. There were three products in the box, which is the Watery Toner, Watery Lotion, and Moisture-Holding Seed Cream. I'm sure a lot of you guys are wondering what Chia Seed is, it is a superfood that is able to boost energy, stabilise blood sugar, aids digestion and even lower cholesterol. Apart from its high concentrate of calcium, manganese, phosphorus and omega-3 fats, the seed can soak up ten times its weight in water. When applied, the seed can help your skin stay hydrated for longer. THEFACESHOP goes the extra mile by using only organic Chia seed without any addictives and is dermatologist approved. Initially, I was wondering how to use this as the pack itself doesn't have any cleanser, and I was used to always having the cleanser in any normal 3-step pack. But luckily Mimi posted in the Bag of Love website on how to use it. On cleansed face, pat on Watery Toner on the face. Follow this by massaging in the Watery Lotion during the day and the Moisture-Holding Seed Cream at night. What makes the Moistfull Aloe Skincare set so awesome is the aloe. The aloe contains abundant moisture and its gel in the leaves have an endless list of medicinal effects: it is an astringent (close pores and contract blood vessels and tissues to stop fluid discharge), an emollient (helps to moisturise, soften and smooth the skin), antiseptic and a cell proliferant (quickly regrows new cells in wounds and burns). This Moistfull Aloe range also harnesses the moisturising powers of the baobab tree, repairing properties of lavender and chamomile for skin as flawless as the Korean stars! The range is also mineral oil free, paraben free, and talc free. I'm pretty sure I piqued your curiousity when I showed you just the pink bag in the beginning right? The bag is truly the epitome of Asia. It looks like those kawaii Japanese bags, and is all feminine too with lace and a little ball of fluff in place of a zip handle. And now presenting to you, the contents of what's in the bag. The Liss Ultime Smoothing Shampoo for Unmanageable Hair cleanses, calms and smoothes rebellious, frizzy hair with its nutrient-packed olive and argan oils. The conditioning action provides lasting smoothness and also humidity protection to ensure hair behaves themselves. This is one of the bestselling brands in Japan, and this particular cleanser is a favourite amongst the Japanese. This facial cleansing foam creates a rich and creamy lather that completely washes off dirt and impurities to leave your skin squeaky clean. Usually with washes like this, skin is left tight and dry. Not with this one though! It has hyaluronic acid to help skin hold in its natural moisture. Hyaluronic acid is also a “smart nutrient” as it can adjust its moisture absorption rate based on the humidity—relative to the season and the climate. It also has citric acid which helps in collagen building and skin whitening.Who doesn't love a product that promotes collagen building? Collagen is a layer beneath the skin that contributes to your skin's elasticity. Therefore, the more collagen your epidermal layer produces, the more elastic your skin is, and the less wrinkles you get! As the name suggest, this BB cream specialised in smoothing the skin surface while covering visible pores. With the sebum control function, it also keeps skin smooth without any stickiness or oil. This BB cream is a combination of a moisturising cream with a high skincare effect and a tinted makeup base. It is useful when you are busy or on casual outings. They have 50 unique and funky colours for every taste and style! I saw in other blogs that other people got different colours like red or brown. I'm actually quite happy to get this colour. It's a little of an aquamarine colour, blue-green, kinda like turquoise? and the best part is, it has a metallic sheen! I'm currently using this shade on my nails, and it looks really nice. :) Review will be up soon! So don't wait. Limited bags are left for August, so make sure you subscribe today! Each bag is only RM39.90, and from my previous posts on Bag of Love, you will have seen that the products you get are INFINITELY worth more than the price you pay for it. Hurry up! Subscribe now! Bag Of Love ??!!! Aaaaahhh.. this blogpost is so poisonous.. hahahaha !!! Sighh.. just check their page.. unfortunately, another beauty box that only send to Penisular Malaysia.. Booo..
Ooooohhh.. ya wor.. I see from their website.. they mentioned "We are currently only available in Penisular Malaysia"